iJoomla Ad Agency allows you to display ads based on keywords. This feature is important because it allows you to minimize the amount of packages you need to create and at the same time allows you to display ads based on targeted keywords. 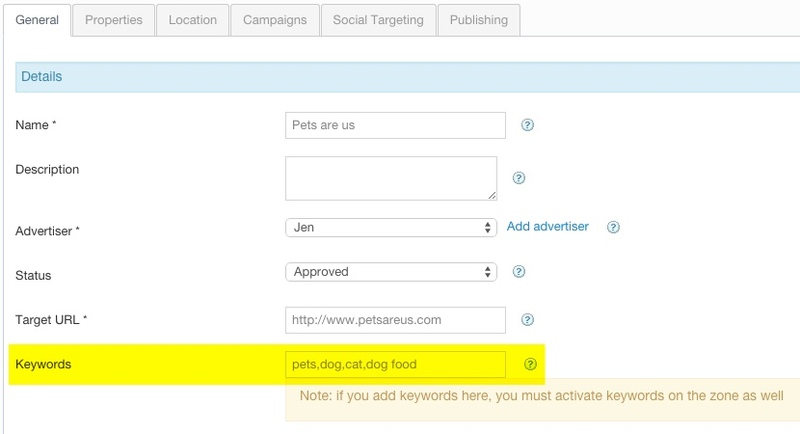 For example, if a particular article is about dog food, you can display ads with keywords such as "dog, food, dogs," etc. Activate keywords feature on the zone you want to display your ads on. Add keywords to each banner/ad you want to include in that zone. Only admin has the ability to set up keywords for the banner/ad. This is to prevent advertisers from entering unrelated keywords and harming the integrity of the advertising system. The keywords specified in the banner/ad properties are compared to the keywords metatag of the article the zone is being displayed on. Therefore, it's important to have your keywords metatags set up. An easy way to enter all the keywords metatags is by using the Meta Tags Manager of iJoomla SEO.